The Family Post of two weeks ago advertised the “Ezra Institute Escarpment Lecture Series”, with Dr Peter Jones set to address the topic: Carl Jung, Psychology and Jordan Peterson on Friday, June 15. Jordan Peterson: a lecture on him sounded interesting to me – and I’m grateful I went. As an aside, the Ezra Institute (feel free to Google it) has bought the sprawling property directly east of Beamer Memorial Conversation Area on Ridge Road in Grimsby. The idea is to use that property for a Francis Schaeffer style l’Abri instruction facility. It’s also where this lecture series is held. Neat to have such opportunity in our back yard! Jordan Peterson catapulted into fame a couple of years through his resistance to Bill C-16 (“An Act to Amend the Human Rights Act and the Criminal Code”). Peterson, a clinical psychologist connected to the University of Toronto, objected loudly to the intent of the Canadian federal government to compel Canadians to use specific pronouns in relation to specific persons (ie, instead of only he, her, she, him, adding also ze, zer, etc) depending on the preference of the person you are talking to (or about). His insistence struck a chord with the public, and suddenly Peterson became a household name. As a result, his you-tube lectures on psychology went viral (particularly among millennial males) and his latest book, 12 Rules for Life, has become an international best seller. Though released not half a year ago, the book has already sold over a million copies in North America alone, and has been translated into multiple languages including Mandarin and Russian. Reactions to Peterson have been strongly mixed. 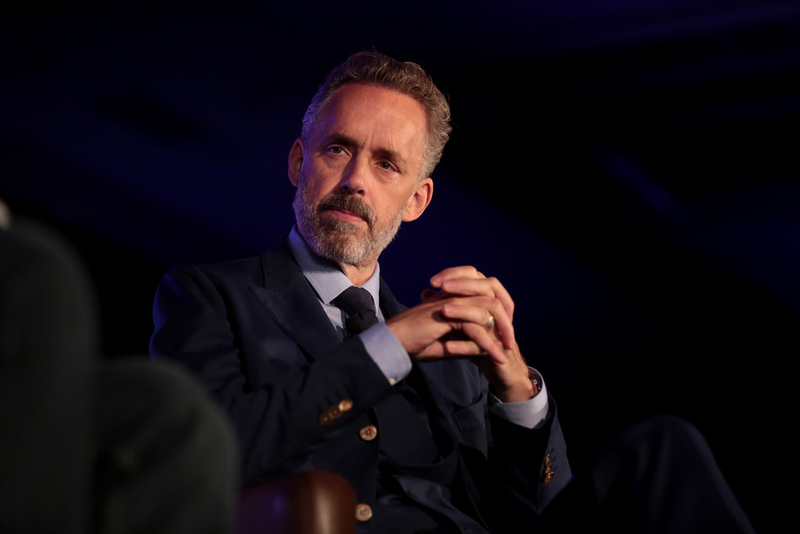 The liberal left wing of our society largely despises Peterson, while the conservative right wing tends to love him. He says things that many Christians deeply appreciate. His rejection of government overreach as described above is but one example. In his books and lectures he shows he’s read the Bible, and he offers insightful analyses of Biblical texts from his perspective as a clinical psychologist. One sister in the congregation said to me a couple of months ago that Jordan Peterson is “so close” to being a Christian himself. It raises the question: should we jump on the Peterson bandwagon and hail him as a voice to admire and a prophet to follow? Since I had read a number of Peter Jones’ books over the years, I was sure he could help provide a good answer to that question. The lecture I heard the other night did not provide a board outline of what Peterson stands for; instead the speaker sought to expose the well from which Peterson draws his thinking. That analysis was insightful to me, and I think it worthwhile to share it with you. What follows is not a summary of the lecture but my working with the material I learned. Catechism students in the congregation will recall the picture I have repeatedly drawn on the whiteboard in the classroom: a circle (the globe, this world) with a box around it. The point of the picture: reality is whatever the eye-on-earth sees, be it the physical eye or the eye of the mind. So: there is no reality beyond the box around the globe. On the whiteboard I then place a second box above the first box, denoting Heaven, God’s residence. Then I tell the students: we who are Downstairs cannot see the Upstairs, but that doesn’t mean there is no upstairs above your living room. In fact, God has revealed (Holy Scripture) that he has created a two-roomed world, with Downstairs (earth) the abode of man and Upstairs (heaven) his abode. From Upstairs he sovereignly directs and controls what happens both Upstairs and Downstairs. Paganism denies that reality comprises a two-roomed world, with Upstairs the abode of the Creator and beyond our ability to discover. Pagan religions do acknowledge the existence of spirits and demons “up there” but see them as extensions of what is “down here” (perhaps as spirits of departed ancestors) and so not as inhabitants of a second room known as the Upstairs of the Bible. More, paganism would tell us that we down here and they up there can connect with one another through practices of occult, mediums, dreams, etc. Carl Jung (1875-1961) was a Swiss psychiatrist and psychoanalyst who founded analytical psychology. The worldview commonly acceptable in the days when Carl Jung labored was two-roomed, with western thinking still broadly embracing that the Creator was real (in heaven) and that God revealed himself on earth through his holy Word. But Jung emphatically rejected this two-roomed perspective and insisted that reality consisted of one room alone – what I’ve called Downstairs. The spiritual and the world of spirits was not “out there” in the sense of Upstairs but was instead deep inside you – part of Downstairs. Jung was insistent that we need to rid our thinking of the Christian two-roomed concept and need to return to the pagan one-roomed concept the fathers embraced before Christianity corrupted their natural religion. In step with that insistence, Jung taught that inner deities are the source of your dreams, fantasies and instincts, and so you need to analyze those dreams and dig down to what the inner is really telling you if you would cope well with real life. The listening and the unpacking is the science of analytical psychology. That’s why to Jung’s way of thinking, religion and psychology need to merge. In the years since Jung did his work, western society as a whole has replaced the two-roomed view of the Christian past with the one-roomed view of paganism. Jordan Peterson (born 1962) is completely comfortable in this one-roomed worldview. In his years as a practicing clinical psychologist, Peterson has spent countless hours with hundreds upon hundreds of clients. As these clients have shared with him the anxieties and stresses of their lives, he has drawn their attention repeatedly to their inner instincts, their dreams and their fantasies, and as a psychoanalyst has sought to help his clients hear that inner deity and follow its guidance. To be clear, Peterson does not assume that everyone’s inner voice -that’s the god within- would say chaotic or contradictory or absurd things. Peterson reminds us that we’ve been on this earth for millions of years, and so there’s a code of right and wrong built into our genes. As we’ve journeyed through the eons on our evolutionary journey to what we are today, we’ve picked up natural wisdom together with such forebears and cousins as lobsters and chimpanzees. For communal survival we need to tap into that inner wisdom. Peterson’s 12 Rules for Life list a dozen examples of this natural wisdom, and through his book he explains how we got this wisdom and why it’s imperative for a good life to embrace this wisdom. As I read the book, I can imagine Peterson coaching his clients into hearing from the inner voice the particular tidbit of wisdom unfolded in each chapter. The Christian listening to (or reading) Peterson will notice that he makes considerable use of the Bible. We need to notice, though, that he does not read the Bible as you or I would. We read the Bible as a book originating from Upstairs since its Author is ultimately God the Creator. Peterson reads the Bible as a book from Downstairs, as an ancient record of how the (Jewish) fathers analyzed and worked with their inner instincts. To Peterson the Bible is fundamentally no different from any other ancient texts, be they written (eg, the Hindu Bhagavad Gita) or oral (eg, North American First Nations stories). All are myths, containing stories communicating kernels of enlightened wisdom that we can use to help us understand the truth coming from the inner self. As a professor in clinical psychology, Peterson has worked with all these myths to get a sense of the deeper meaning embodied in the stories. That effort comes out in his discussion of Bible texts in his book and in his talks. And yes, from time to time he does say some profound and insightful things about a given Bible passage. For my part I appreciate that Peterson dares to espouse traditionalist positions and critique much of what the liberal left says. That critique undermines liberal thinking, and it’s his courage and forthrightness in doing so that spawns the rabid criticism he attracts from many on the left. I think we can learn from Peterson how leftish thinking is bedeviled by contradictions and misinformation, and we can use his arguments to unsettle the confidence of those entrapped by that thinking. For this part of his work I eagerly cheer him on. I do not believe, however, that just because Peterson is the enemy of my enemy that he must therefore be my friend. Yes, Christians will largely be quite comfortable with the 12 Rules for Life he set forth in his book. I applaud Rule 1: “Stand up straight with your shoulders back.” I applaud Rule 2 as well: “Treat yourself like someone you are responsible for helping.” And Rule 3: “Make friends with people who want the best for you.” Etcetera. But we need to realize that Peterson’s arguments for these 12 Rules are rooted in a one-roomed worldview, so that he justifies them and argues for them from a pagan perspective. The received wisdom he’s capturing in his 12 Rules ring true to us because this wisdom has come to us through a Christian history and heritage. But he’s given them a pagan foundation. Peterson is very popular today. That’s because, I’d venture to say, he speaks in today’s categories, putting into words how today’s people actually see the world – one-roomed. Yet he doesn’t join the liberal left in despising the received wisdom of what it takes to cope with life – and that’s why much of what he says resonates with those of our society who’ve been raised with a two-roomed worldview. We do well in my opinion to try to understand Peterson well precisely because he puts into words what’s popularly thought in the homes of so many across our nation. That understanding can help us engage with those around us.